It is the present only another EG parent could truly appreciate. It is the thoughtful gesture that needs no reward greater than a simple nod of thanks, and yet deserves so much more. At least an EG Parenting award. Zaltu, being the little Goddess of Strife that she is, has refused all attempts of “pacifying” by us – her mere parents and spawn-points. Apparently, our pacifiers and tools are not good enough. And then we received this beauty from Al and Maria. Zaltu loves this thing. Sure, she spits it when she knows it’s nap time ( don’t we all spit the dummy from time to time?) but the process of putting her to sleep has gone from 40mins to 5min. And she stops cursing in Baby if I give it to her straight from the freezer (we ARE currently parked in North Queensland, Australia in the middle of Summer). Sure, maybe it has some special shape she likes. Might even be the soft texture. But I know, and ALL the minions know it is because of the absolutely awesome image it maintains for the youngest of EG Inc.
What awesome gifts have you received from understanding minions? 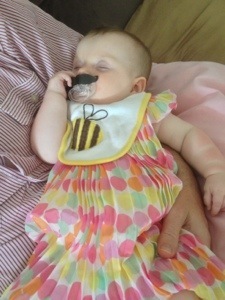 This entry was posted in Evil Genius Parent Award and tagged baby, gifts, pacifier. Bookmark the permalink.